This post was updated on Dec 5, 2017. Diverse genomes and genomic targets require a variety of tools to engineer them effectively. Since the discovery and engineering of dCas9, the CRISPR toolbox has expanded to include a variety of natural and engineered Cas proteins. Read on to learn how these tools can be used to expand CRISPR's reach to new genomic loci. Cas9 can be used to modify any desired genomic target provided that sequence is unique compared to the rest of the genome and is located just upstream of a Protospacer Adjacent Motif (PAM sequence). 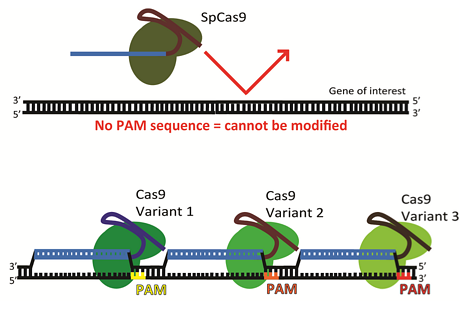 The 3-5 nucleotide PAM sequence serves as a binding signal for Cas9. and this sequence is a strict requirement for Cas9-mediated DNA cleavage. While PAM sequences for the commonly used S. pyogenes Cas9 (3'-NGG) are abundant throughout the human genome, they are not always positioned correctly to target a particular gene. Furthermore, a target sequence may have high homology elsewhere in the genome. These off-target sequences may be unintentionally mutated along with the desired target locus. The PAM sequence is of particular concern when trying to edit a gene using homology directed repair, since HDR-mediated gene editing is most efficient when target sites are located in close proximity to the region to be edited. In this blog post, we will cover three ways to circumvent this limitation: 1) the use of novel S. pyogenes Cas9 variants with varying PAM sequences, 2) the use of Cas9 homologs derived from species other than S. pyogenes, and 3) the use of non-Cas9 enzymes. The D1135E variant is far more selective for the canonical S. pyogenes PAM sequence NGG compared to wild-type SpCas9, which also displays some cleavage with an NGA PAM. This variant may increase the specificity of genome modifications at DNA targets adjacent to NGG PAM sequences when used in place of wild-type SpCas9. The remaining variants (VQR, EQR and VRER) recognize novel PAM sequences (shown above). The VQR, EQR and VRER Cas9 variants are capable of cleaving genomic DNA in mammalian cells and zebrafish embryos, and they can be used to modify genomic loci that cannot be modified using wild-type SpCas9. The number of off-target cleavage events for the VQR and VRER variants is similar to wild-type SpCas9, indicating that the variants are likely just as selective as wild-type SpCas9. These VQR, EQR and VRER SpCas9 variants effectively double the targeting range of CRISPR/Cas9 within the human genome. Over 20 additional Cas9 orthologs have been isolated, and our understanding of their PAMs is shown in the table below. Non-SpCas9s bind a variety of PAM sequences, which makes them useful when no suitable SpCas9 PAM sequence is present. Furthermore, non-SpCas9s may have other characteristics that make them more useful than SpCas9. For example, Cas9 from Staphylococcus aureus (SaCas9) is about 1 kilobase smaller than SpCas9, so it can be packaged into adeno-associated virus (AAV). AAV-mediated delivery of SaCas9 has been used successfully to target liver cells of mice in vivo (e.g. CRISPR muscular dystrophy research). At 984 amino acids in length, Cas9 from Campylobacter jejuni (CjCas9) is even smaller than SaCas9 and is also compatible with AAV delivery. Amrani et al. found that NmCas9, another small ortholog, displays lower off-target editing than wild-type SpCas9, even when targeting sites that are known to produce off-target editing with SpCas9. When choosing a Cas9, remember to check that your tracrRNA and crRNA (or synthetic gRNA) are derived from the same species. The isolation of novel CRISPR proteins has and will continue to dramatically increase the number of CRISPR applications. The first non-Cas9 CRISPR protein adapted for genome engineering was Cpf1, a nuclease that generates double strand breaks in target genes resulting in the formation of “sticky ends” rather than the blunt ends created by Cas9. Kim et al. and Kleinstiver et al. 2016 found that Cpf1 displays lower off-target editing than SpCas9, with Kleinstiver et al. comparing AsCpf1 to engineered high-fidelity Cas9s. Cpf1's 5'-TTN PAM also makes it easier to target AT-rich genomes. Type VI CRISPR systems, which target RNA, offer additional targeting flexibility. Cas13a (formerly C2c2) has been adapted for targeted RNA cleavage in mammalian cells. The REPAIR (RNA Editing for Programmable A to I Replacement) system fuses Cas13b to RNA deaminase ADAR2 to create an specific RNA editor. Cas13 enzymes are advantageous because they do not require a PAM, and RNA targeting is potentially reversible since there is no genomic edit. Some Cas13 enzymes require a single base protospacer flanking sequence (PFS) adjacent to the target, but many do not, showing the flexibility of this system. As the number of CRISPR reagents continues to grow, so too will the number of reagents available through Addgene! If you're trying to decide which CRISPR tools are best for your experiment, check out our CRISPR guide or email us at help@addgene.org. Note: Mary Gearing contributed to the update of this post. 1. Kleinstiver, Benjamin P., et al. "Engineered CRISPR-Cas9 nucleases with altered PAM specificities." Nature (2015). PubMed PMID: 26098369. Find plasmids from this publication at Addgene. 2. Ran, F. Ann, et al. "In vivo genome editing using Staphylococcus aureus Cas9." Nature (2015). PubMed PMID: 25830891. 3. Kim, Eunji, et al. "In vivo genome editing with a small Cas9 orthologue derived from Campylobacter jejuni." Nat Commun. (2017). PubMed PMID: 28220790. 4. Amrani, Nadia, et al. "NmeCas9 is an intrinsically high-fidelity genome editing platform." bioRxiv (2017). doi:10.1101/172650. 5. Zetsche, Bernd, et al. "Cpf1 is a single RNA-guided endonuclease of a class 2 CRISPR-Cas system." Cell (2015). PubMed PMID: 26422227. 7. Kleinstiver, Benjamin P., et al. "Genome-wide specificities of CRISPR-Cas Cpf1 nucleases in human cells." Nat Biotechnol. (2016). PubMed PMID: 27347757. 8. Abudayyeh, Omar O., et al. “RNA targeting with CRISPR-Cas13.” Nature 550(7675) (2017):280-284. PMID: 28976959. Find plasmids from this paper at Addgene. 9. Cox, David B.T., et al. “RNA editing with CRISPR-Cas13.” Science (2017):pii: eaaq0180. PMID: 29070703.